Step 2 In a large saute pan, melt the butter until it foams and subsides, then add the sliced apples, sugar and salt. Cook over medium heat until the apples caramelize and the sauce is thick, about 10 minutes. Step 3Taking the pan off the flame, pour in the Calvados, and then return it to the heat; if it doesn't ignite in the pan, tip the liquid toward the front of the pan, being careful not to let it spill, and light it with a match. Let it flambe until the flames subside, about 10 seconds. Stir in the lemon juice. Step 4Spoon one-fourth of the apples into the middle of a sweet crepe; fold it into quarters and top with a dollop of cinnamon cream. Serve immediately. In Recipes-list.com we have selected the most viewed recipes from category - Desserts . Enjoy the best recipes specially selected for you! 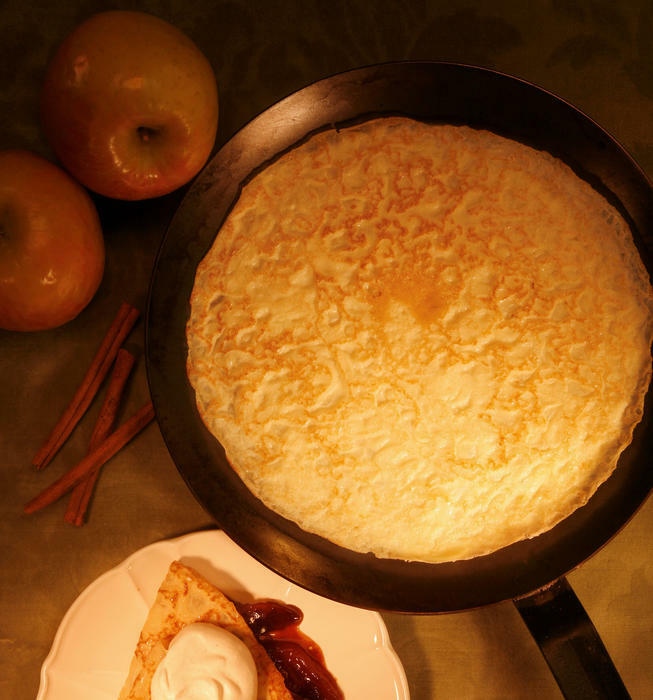 Apple and Calvados crepes is the right choice that will satisfy all your claims.